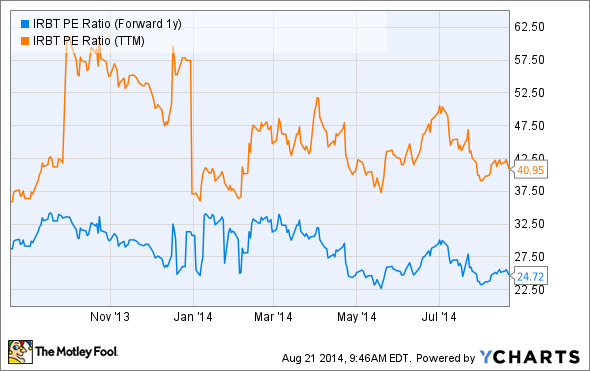 Is iRobot a Buy After its Big Selloff? Many believe iRobot will be a highly successful company in the future, while others think it's an overvalued vacuum-maker. But does the stock present good value? Although the stock is only down 1% in 2014, shares of iRobot have given investors a volatile ride so far. Above: iRobot 110 FirstLook. Source: iRobot Corp.
Shares of iRobot (NASDAQ:IRBT) have been hit hard since reporting earnings in mid-July, down 11.5%. And while the valuation may seem a bit stretched, investors could use the recent pullback to buy into a company with great potential, at attractive prices. iRobot designs, builds, and distributes robotics that are designed to help humans. Its largest segment in terms of revenue comes from its Home Robotics division. These robots consist of vacuums, floor scrubbers, and pool cleaners, among other products. Then there is the company's defense robotics. These robots are ordered by the government to make combat situations safer for soldiers. They can also be used by other security personal and law enforcement, such as police units and airport security. Finally, there are the corporate and health care robots, which is a relatively new product segment. These robots assist doctors with patient monitoring and making timely and accurate decisions. Robots in the corporate landscape are being used to increase efficiency, specifically for Fortune 1,000 companies. iRobot Mirra 530. Source: iRobot Corp. Prospective investors who are looking to get into a stock, usually want to do so at a good price. iRobot has been a tricky one, as the stock has been volatile due to its small market cap and light trading volume, (meaning directional moves can easily be overdone in either direction). The stock shot higher to start off 2014, nearly touching $50 per share in March before going on a precipitous decline, down to roughly $30 per share. After this large decline, the stock rocketed up to $42 before declining back to $32. Is this the absolute 'you-gotta-buy-right-now' signal? Probably not. The above chart shows investors that while there might be a little bit more downside in the stock, shares are clearly very close to valuation levels that other investors have historically found attractive. Shares of iRobot were, in my opinion, unfairly punished on its latest earnings report. The company raised its full-year earnings per share guidance to $1.10-$1.20, from $1.00-$1.15. However, the company lowered its full-year revenue guidance to the range of $555 million-$565 million, from $560 million-$570 million. For a company that trades at 41 times and 25 times last year and next year's earnings, respectively, it's not encouraging to see a drop in revenue guidance. However, the $5 million drop in revenues isn't lost, so much as it is delayed. "The increased visibility has clarified that certain order deliveries are being requested by the customers for early 2015, resulting in a decrease of the 2014 revenue expectation for Defense and Security by $5 million to $45 million." As you can see, the $5 million in revenues is expected to come in early next year, instead of late this year. CFO Alison Dean went on to say this delay is "due to the timing of orders," rather than a lack of demand or any concerns related to budgetary issues. iRobot Roomba 880. Source: iRobot Corp.
Shares of iRobot have declined over the past few weeks -- and certainly since the beginning of July, where the stock has tumbled 16%. Still, the company raised its full-year earnings per share guidance and pushed back a measly $5 million in revenues into early 2015. Keep in mind, $5 million is less than 1% of total revenues. When paying a premium valuation for a stock, it's of course nice to see management raise estimates, not lower them. However, the stock has paid the price with the recent sell-off and I think investors who are looking to buy the stock for the long-term -- and not trying to time the short-term -- are being presented an opportune time to buy into a company with a bright future.